C.A. Szarek Author: Thank you!!! AND GIVEAWAY!!!!!!!!!!!!!!!!!! I want to give a huge thank you to Angie and Angie and Jo-Anna at Twinsie Talk Reviews for organizing and executing an AWESOME blog tour for me and Sword's Call. I got to go to some awesome places around the web, and meet a tons of new people and see some GREAT GREAT blogs! People are AWESOME! I had a more than fantastic tour and I am so glad I met the awesome people of these blogs. Thank you to all the people, friends (old and new) and new readers that commenting on my posts! Congrats to all the winners of my giveaways!!!!!!!!!!!! 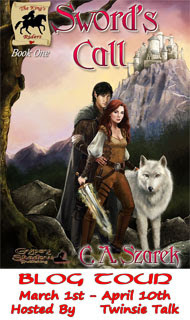 One Commenter here will receive a SIGNED PAPERBACK OF SWORD'S CALL! Looking forward to doing it all over again for Collision Force in July! You guys are AWESOME! Thank you for all u did for me!! YAY SC and YAY TwinsieTalk!!! It was my pleasure and honour to have you, SSB!!! And any time. Thanks Twinsie's for all you do... Chrissy I wish you great success with your book!! It was my pleasure!!! Yay for a rocking launch for Sword's Call!